Busy weekday schedules make cooking each night nearly impossible. My kids are running from one place to another, and I'm caught drinking coffee or wine and running after them. Meaning, I need to plan meals with very little prep but which deliver on flavor and fill up my always-hungry crew. Lucky for me I have a husband who loves to grill and a crockpot that I can put to good use whenever it's necessary. My all-time favorite crockpot recipe is also the easiest recipe in my arsenal. I thought you busy ladies might enjoy this easy weeknight meal. I should also mention this is a great recipe for Thanksgiving. By cooking your turkey in the crockpot, you'll also free up room in the oven for all those delicious sides - like these Twice Baked Sweet Potatoes - a simple, single-serving side dish to the meal which is sure to rock your world. Make sure that you remove all unnecessary parts from the turkey, this includes giblets and/or gravy packets. Generously salt and pepper the outside of turkey and then evenly sprinkle the oregano all around. 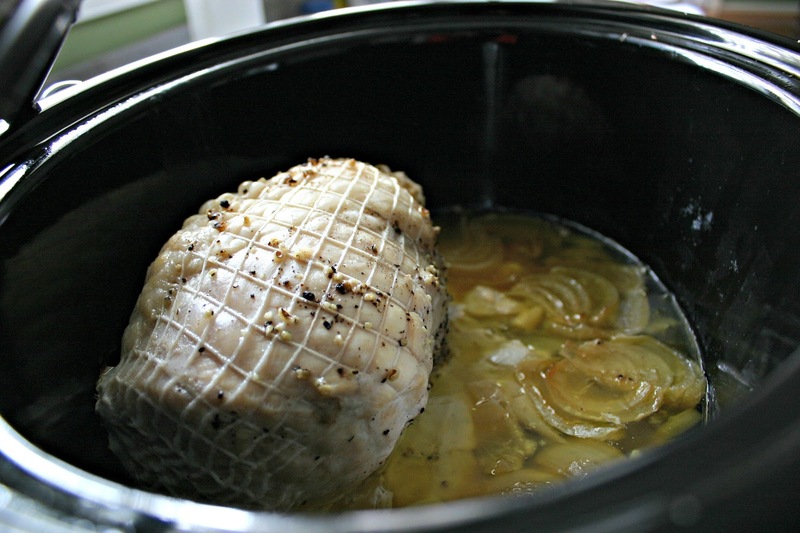 Place all the ingredients in the crockpot and let it sit on low for up to eight hours. The turkey thaws as it cooks and it creates a thin but delicious broth. You can use it to dress your turkey, or you can thicken it to make a more traditional gravy. Add 2 Tablespoons of flour or cornstarch to 1/2 cup of hot water until it is completely dissolved. Remove the turkey and large onion pieces from the crockpot, turn the heat up to high, and then add the flour/cornstarch mixture. Be sure to stir consistently for about 15 minutes, or until the gravy thickens. 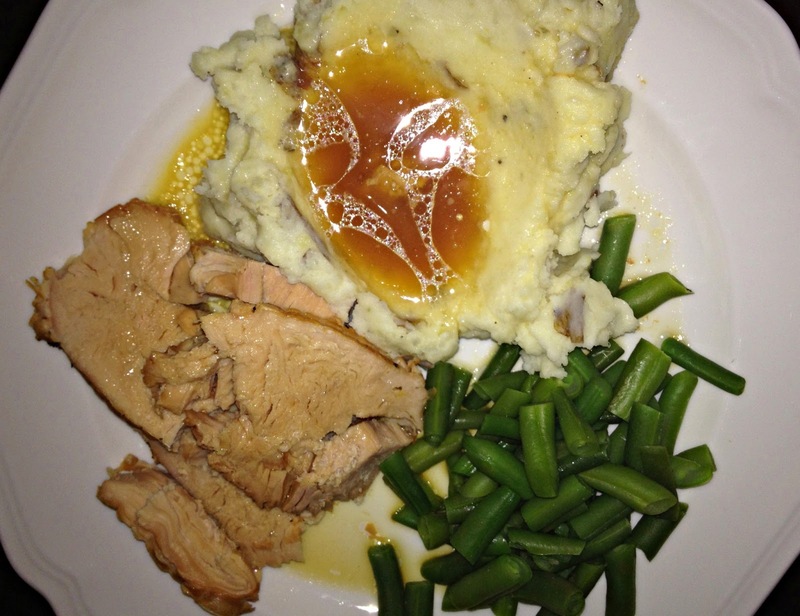 No matter the season, a Thanksgiving-like turkey is always a delicious menu option. I hope you enjoy it as much as I do. Wait, don't throw away those leftovers! Here's a great Turkey Salad recipe for Day 2, and it's also perfect for a packed lunch. It's so yummy! Sorry about the floral, I'm in a weird transitional, post-baby size and I don't want to spend a lot of money on new clothes that I hope will only fit for a couple weeks/months. I ready to participate this week though! I have never owned a crock pot - but have eaten food cooked in them and love it!! Hope you are having a wonderful day! Honestly, my crockpot is my saving-grace sometimes. I love walking in from work and knowing dinner is already done. Plus it smells incredible! Thanksgiving is delicious anytime of year! Thanks so much for visiting. Oh for sure on the crockpot front! Keeps the house cooler than the oven and sadly, I'm afraid of our grill, so I have to wait on hubby! If I want a meal ready when he gets home, and know I'm going to be out with the boys all day, it is foolproof! And super yum--turkey!! Maybe I don't have to wait until Fall??!!! Hope all is well with y'all! Hi Lindley, I can't image how you do it with four little guys running around. It's tough with just one!!! I think the fact that you can coordinate any type of dinner is an accomplishment! I'm having a hard time with the crook pot right now, but that is a great recipe of mom's. I like to add some chicken stock to it. It keeps it extra moist. My problem is though I just can't will myself to get up before 4:50 to get things ready in the crock pot. I guess I could get it ready the night before, but considering I have to put it on a timer I like some of the food to be frozen. That way as it sits out for a little while before cooking I don't have to worry. I'm at a loss on some of it, but the Turkey/Chicken is one of the things I still like to do. I have been trying new recipes when I can if you are interested Brittany I can give you a few. This is definitely one of my favorite recipes and I love a taste of Thanksgiving in the Spring, Summer... If you have other crockpot recipes I would love for you to share them. How long do you cook this size roast in the crock pot when its frozen? When you have a frozen turkey you can cook it on low for 8 hours or on high for 5 hours, just make sure to remove any gravy packets and/or giblets. what if it is a defrosted turkey? Celebrating Easter morning with family outside of the house and hoping to come home to a cooked but still moist turkey in the crockpot for Easter dinner... any time recommendations? I think I many be responding to this a little too late but just in case you want to try this in the future I wanted to make sure to get back to you. I honestly haven't tried this with a defrosted turkey but I'd try 2 hours on medium-high. Make sure to test your turkey with a meat thermometer. The thigh meat should reach an internal temperature of 165 degrees F. I'd love to know your results if you try it with a defrosted turkey. Thanks for reading! Lance, I am so glad to help! I'm working on a recipe to take the drippings and make a more hearty gravy. I'm sure you're going to do an excellent job hosting Thanksgiving. Also, congratulations on your recent nuptials - it sounds like there's a lot to be thankful for this year! Sounds delicious but is missing a cooking time. So how long do you cook it?? Thanks! If you have temperature settings on your crockpot you can cook it on low for 8 hours or on high for 5 hours. Oh my gosh I am so pinning this for later! Would it be just as good doing chicken breasts instead of a turkey breast? Sadly, I put my frozen turkey in the crock pot (still packaged and frozen) and my 6 quart crock pot was way too small. There was no way the lid would have went on. Chicken breasts would work but since they are much smaller I would probably only cook it on high for 4 hours. Just be sure to take the internal temp prior to eating to make sure it's done. You could also opt for a small, whole fryer chicken and cook similar to the turkey time. Let me know how it turns out!